My Ojos: Be aware, eat aware. On my second visit to the City Market in Nairobi, I made my way to the far side where meat is butchered and packaged for sale. The scene is chaotic, with small stands every few feet surrounded by crates containing the carcasses of animals. Fresh cuts of meat flew from block to bag to buyer while prices were haggled in loud voices, so to be heard over the ceaseless whop whop whop of the cleaver on the butcher block. I left footprints on the bloody pavement as I walked from one stand to another and watched the craftsmen skin goats, gut fish, and entreat me to buy pig's feet. I was shocked and somewhat sickened, as I imagine many Americans would be. Especially for those of us who live in urban areas, the sight of meat in that intermediate state - no longer roaming the pastures, but not yet wrapped in cellophane at the grocery store - is unfamiliar and unsettling. We understand intellectually that steaks come from cows, but are not accustomed to the blood and skin and stench that accompanies the killing of an animal. We are no longer connected to the creatures we consume. This is problematic in several ways, but primarily because our detachment has allowed the meat industry in the United States to run amok. I highly recommend you click over and read this interview with Michael Pollan, who writes for the New York Times and is the author of several books examining the social and scientific consequences of our modern food industries. It overwhelms me to consider the colossal impact of the meat industry on the environment and our health. Beef production alone requires diverting land to grow immense quantities of grain, shutting cattle into feed lots where they are denied free movement, and pumping them full of antibiotics when this unnatural corn-based diet inevitably makes them ill. I am not ethically opposed to eating meat. Beef, chicken, fish, pork, lamb, and goat are consumed on the regular in the Ojo house. In my view, for an animal to be born, enjoy life until it's prime, and go on to become part of another life? It's almost poetic, in a way. Sacred. Many cultures in the past understood this, and had strict rules governing how an animal was slaughtered, who could eat the meat, and various ceremonial rights to be performed when meat was consumed. The animal died, but it's life was not taken for granted. The hypocrisy is apparent. Many American urbanites view it as primitive, inhumane, or just plain disgusting to slaughter an animal with their own hands. They are unable to fathom the actual killing and dressing of an animal for consumption. And yet, we are indirectly responsible for more killing than ever before - for example, Americans are now eating an average of 58 pounds of chicken and 57 pounds of beef per year (source). I do not plan on cutting out meat, but I hope to gradually change my family's approach to consumption. We have started eating smaller quantities of meat, and not with every meal. Since we are eating less, we can afford to spend a little more on quality animal products. Whenever possible, we buy grass-fed beef and meat from animals not treated with antibiotics and artificial hormones (if you are in the Inland Empire, Clark's Nutrition is a great place to find these products). We do not take an all-or-nothing approach to health. Little changes are easier in the short term, sustainable in the long term, and add up to make a big difference. Sometimes I miss the sights and smells of the open air meat markets, visceral though they may be. 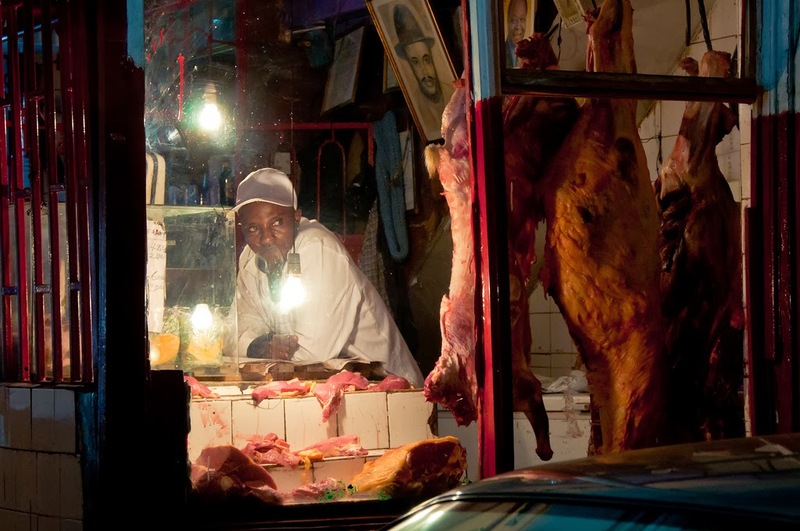 The experience of walking through Nairobi's hectic shops gave me an opportunity to think about the origins of my food. Few supermarket meat counters in America, with their cases full of bloodless, scentless meat garnished with plastic parsley, bely any relation to the feedlots and slaughterhouses that keep our supply chain humming. There is power in knowing where your food comes from, in understanding what you put in your body and the affect it has on your health and the health of the environment. The truth is raw, it stinks, but there's no avoiding it. Empower yourself.